These are among many objections often posed by academic scientists, when considering and choosing against a career in industry. But are they real or myths? At our recent SIUOxford event, people from all walks of science joined us to learn about the transition from academia to industry. The night was the inaugural talk forthe Oxford SIU Career Sessions, an event series addressing different career paths for scientists, e.g. in industry, start-ups, and consulting. The discussion was led by two great speakers: Dr. Jan Nygaard Jensen- the Scientific Director of the new Novo Nordisk Research Centre Oxford and Diabetes Portfolio Manager for Novo Nordisk- who talked from the perspective of a big pharmaceutical company; and Dr. Ita O’Kelly Head of Research Management in Immunocore Ltd and a Visiting Associate Professor at the University of Southampton - who gave the perspective of a medium sized biotech company. • A common arguement from scientists in academia against going into industry is that the industrial employer will be too set in their agenda for research. However, this is a comparable occurence in academia, whereby funding bodies (steered by government policies) determine the major research directions. And researchers are answerable to these bodies, one example being via 'impact statements' in grant applications. • The skills you’re learning right now in your PhD or Postdoc are perfect for a career in industry. • You can make the switch from academia to industry in very different parts of your academic career. • Industry is also filled with some of the most brilliant, creative, innovative people; using the newest technology (and even developing it when needed). • Industry offers a different time management model to scientists, who in academia would have to spend substantial time occupied with writing grant applications. This is especially the case as academic seniority rises. Alternatively, companies keep monetization and R&D in separate departments, thereby removing responsiblilty of scientists to acquire funding. In so doing, the time allocated for 'doing' science receives a bigger allotment. • No matter how hard you try, you cannot plan for everything. Or i.e. you can plan everything, but it’s very likely not going to be true. Embrace opportunities and take pride in the role you’re currently fulfilling. Dr. Jan Nygaard Jensen gave the opening talk of the night, sharing his journey in science, how he got into industry, and why he thinks that he has the best job in the world. Throughout the talk he offered career advice based on his own experience. One of his first pieces of advice was on career planning: You can plan everything. But it’s very likely not going to be true, and in 10 years you’ll laugh at how the plans you had differ to what you actually ended up doing and loving. Focus on the job you’re in, not the job you’re looking for. This job is how prospective employers will see you, and will be the basis of your future job. An important point was made (and later echoed by Dr O'Kelly) on what ends up determining our work. Reflecting on his decision to go to the US for his PhD and later Postdoc, Dr. Jensen smilingly said that one of the reasons had been the bad weather in Denmark. Dr. O'Kelly also spoke about the big influence of her marriage to a Canadian husband and parenting kids on her career path. Dr. Jensen was later offered a position as project manager in Novo Nordisk in Denmark. He worked as a chairman there, which in his own words is being `surrounded by smarter people than you, but being better at taking notes’. On the topic of working for a BIG company, he elaborated that they’re always in motion; they change, and you need to accept that what the company is doing is not about you. And that they can be very complex. The best way to thrive in this complexity is to focus on the job you’re doing. You should also try to be “T-shaped”, which basically means not to put all your eggs in one basket. You should be very good at something specific (the `base’ of the T), but also have a breadth of knowledge across many areas (The `roof’ of the T). It’s often argued that a problem with working in industry as a scientist is that the company decides what you do. And yes, he continues, Novo Nordisk do to an extend decide that; but so do funding agencies in academia. You can just choose a company, where they do the kind of science (e.g. diabetes and obesity) that you want to work with. He explains that a lot out of what he does is out of interest. Of couse, it has to fit with the bigger scheme. But within that, there is a lot of freedom. Bringing a difference to real people is what matters in the end. This is what drives Jan and gets him up in the morning- doing something that will matter in the end. One difficulty in his job is that only 1 in 10,000 ideas will work. So it’s easy to say no. Do something you like (or better yet love). Encourage other people to succeed. This will make you succeed. Always solve a problem, which creates a lot of “pain”. If you actually solve it in the end, it should be worth it. You have to make your job the dream job. Dr. Ita O’Kelly’s perspective differs in several ways from that of Dr. Jensen. Firstly, the company she’s working for - Immunocore - is more of a biotech, rather than a pharmaceutical company. Secondly, it’s much smaller than Novo Nordisk; they have a bit more than 400 employees - about the same amount as the number of daughter companies that Novo Nordisk has! Most significantly, the time she transitioned from industry was different from Jan’s; she had spent more than 20 years in academia, when she made the switch. One of her takeaway messages was that you can transition from academia to industry at any point in your scientific career. She did her PhD at the University of Leeds, and worked as a research associate at Yale University. At this point, she did what could be considered an odd career move in purely academic circles; she moved to Canada to take up a full time teaching job. One of the reasons behind this was that she had met a Canadian partner, again illustrating some of the things that actually end up determining our careers. At the time she felt like she was giving up on science a little bit, but it ended up being a really good decision. The experience gave her an intensive education in how to teach, and when she got back to the UK, her experience made her an attractive candidate for academic positions- she was a young researcher with two years of exposure to teaching . Thus it ended up having a major impact on the academic positions she got afterwards. She used the story to make the point that there was no right track. You can sit in the same university and pick up postdocs, or travel all over the world. As long as what you do adds to you, it doesn’t matter. And that things such as getting married or having kids are the sort of things that direct your career. She eventually made the transition to industry by joining AdaptImmune, and later Immunocore. After more than 20 years in academia, this urge came to her quite suddenly. During her early scientific career she loved science and were driven by pure curiosity butshe was kidding herself that she was still an active scientist. The truth was that she wasn’t. She was writing grants and managing projects. Further to this, she realised that it’s not just companies that dictate the science of their employees; governments and grant bodies steer research. And the government might not have the same knowledge or incentives as industry. She’s been happy with her decision since. 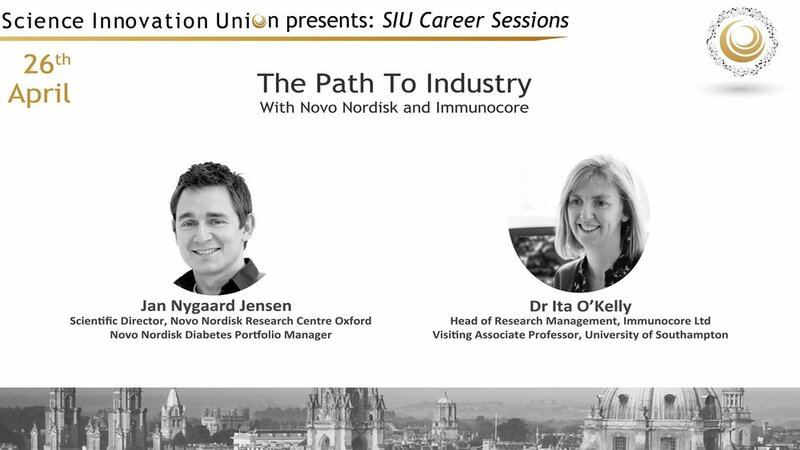 As a spin-out from Oxford, Immunocore is very much an academic organisation that happened to go in the commercial direction. The company - founded only in 2006 - develops TCR based therapies, and are just getting things into the clinic for the first time. She says that as much science goes past her desk as when she was a professor. And there is not much of a difference in the daily work. She spends a lot of her time planning, coordinating, preparing presentations (for the board), and evaluating the science which is done within the company. Her story also serves as good case study that you can transition to industry, even late in your scientific career. Teaching- In industry you’ll be giving internal seminars and teaching techniques; if you’re the expert, you’ll always have a certain amount of teaching to do. Supervision- The ability to supervise `students’. You’ll do this immediately in industry. One of the beauties of science is that you’re curious. You’ll always ask that extra question. You can open up and say `hey, there’s a parallel path here’, or a completely tangent one, but with an end that looks interesting. As a final piece of advice she iterated: It’s not about plans. It’s about opportunities. And when they present themselves to you - jump at them. Always try. Don’t be afraid that you won’t get it. The talks were followed by Q&A, and the lively discussion continued over wine and nibbles at the networking event with the speakers afterwards. Stay posted for the next events of the SIU Career Sessions series and learn about our other events via Facebook and Twitter.